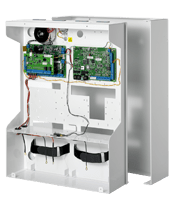 The SPC5350 control panel combines in an optimal way intrusion and access functionality in one system and can be expanded according to specific customers and project needs with up to 128 zones (16 onboard), 128 outputs (12 onboard), 16 system keypads, 16 doors, 8 verification zones. The controller provides 2 X-BUS ports (2 stubs or 1 loop), 16 areas, 500 users with different access levels, memory for 10’000 intrusion and 10’000 access events, integrated Web Server, 2 terminals for the pluggable PSTN and GSM/GPRS communication options, onboard Ethernet interface. The system is expandable with wireless receivers and supports up to 120 Intrunet wireless detectors (mixed with wired zones). 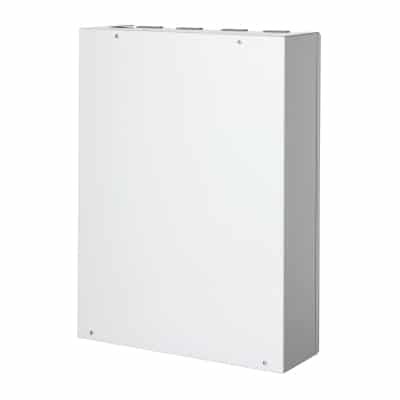 The panel comes in a tamper-protected metal housing with space for 2 optional 27 Ah batteries and 4 additional expanders. Vanderbilt`s SPC5350.320 control panel combines in an optimal way intrusion and access functionality in one system and can be expanded according to specific customers and project needs with up to 128 zones (16 onboard), 128 outputs (12 onboard), 16 system keypads, 16 doors, 8 verification zones. The controller provides 2 X-BUS ports (2 stubs or 1 loop), 16 areas, 500 users with different access levels, memory for 10’000 intrusion and 10’000 access events, integrated Web Server, 2 terminals for the pluggable PSTN and GSM/GPRS communication options, onboard Ethernet interface. 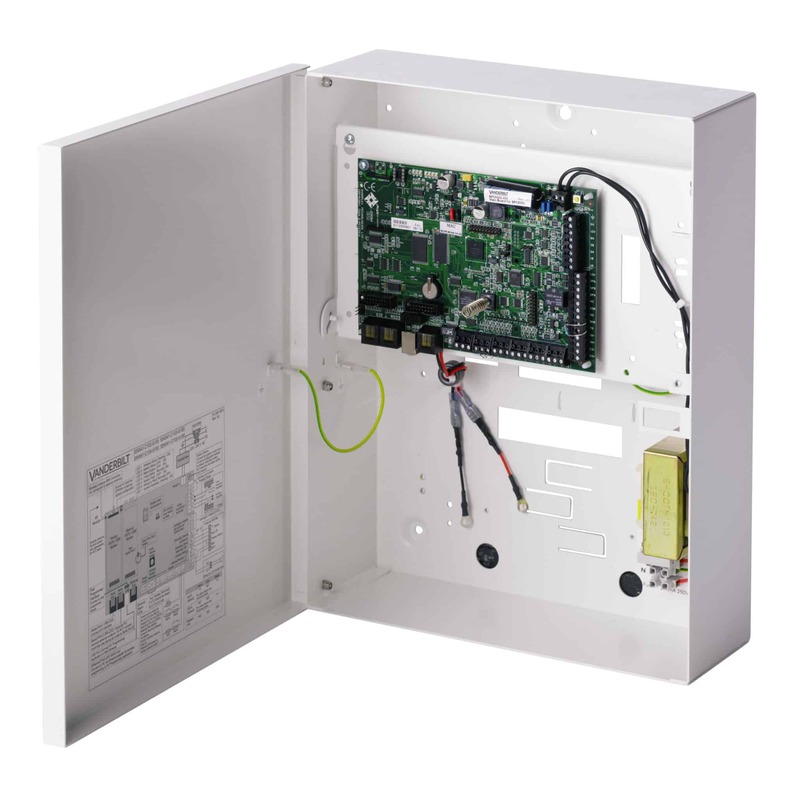 The system is expandable with wireless receivers and supports up to 120 wireless detectors (mixed with wired zones). The panel comes in a tamper-protected metal housing with space for 2 optional 27 Ah batteries and 4 additional expanders. The SPC family provides a common interface for configuration across the range. Each system can be configured locally from a keypad or the connecting directly to the on board web server. Remotely the web server provides the ability to support customers and alter functionality. The SPC system provides a powerful portfolio of communication options. The system is capable of offering IP based, 50136 compatible communications. Along with traditional analogue communications. It is crucial to ensure that security systems are installed professionally and remain reliable. The functionality of the SPC system can be extended to fit specific customer or market requirements. Various triggers from the system (e.g. zones, areas, user identifications, schedules) can be logically combined in order to activate specific processes. The system provides you with the ability to control user’s intrusion and access rights. SPC offers support for a range of access readers. User’s rights can be restricted by time, day or area. Using SPC Connect any IP enabled SPC panel can be remotely accessed. Providing remote access to customers to the web interface and mobile app access.